Johnny Manziel isn't Johnny Football when he's hungry. He's Johnny JamBoogie. 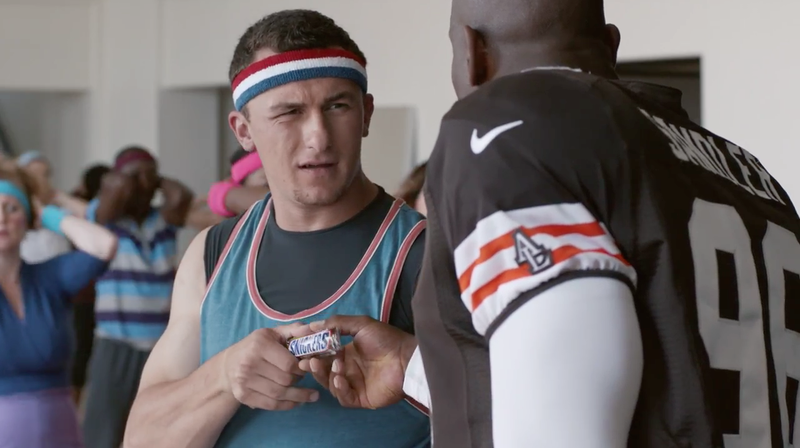 In this new Snickers ad from BBDO New York, the Cleveland Browns quarterback stars as a Spandex-clad man leading an aerobics class full of women. That is, until he's rescued by a teammate bearing a candy bar. It's a variation on a joke that by now is familiar. Last year, the late, great Robin Williams possessed a football coach in a commercial for the brand. In another, Kenny G sat in for a boring storyteller. Before that, Joe Pesci, Don Rickles, Aretha Franklin, Betty White and Abe Vigoda all had their moments. This February, we learned that even Godzilla is a pretty fun guy when he isn't peckish. But Manziel is topical, and his buffoonery helps keep the idea going. USA Today, meanwhile, wonders why Snickers used an actor as his savior, instead of a second, actual Browns player. And on the ad's YouTube page, one armchair quarterback takes issue with a different point: "A better ending would have backup quarterback Manziel eating a Snickers bar and turning into starting quarterback Brian Hoyer." Zing. Regardless, plenty of football fans seem to be getting a kick out of the clip—it has more than 500,000 views since being posted on Thursday. Music Track: "You're My Love"